Have you ever sat back and observed someone, or a group of people and thought, “How are they so confident?” Or perhaps you know of someone who is willing to give just about anything a go? What motivates them and keeps that anxious voice in check? Over the years I have found that the mechanisms which instil anxiety and confidence are quite similar, and by understanding them we can tip the odds in favour of building confidence. One person’s story who typifies this is that of my friend and climbing partner, Andrew Banks. I first met Andrew in the mecca of alpine climbing, Chamonix, France, in August 2016. I was on a month long climbing holiday and had arranged to meet Andrew at a local café on a rest day. I was hopeful that we would get along and head into the mountains to climb a few routes together. However when we met, Andrew told me about the harrowing experience he had just gone through which would cause him to question his desire to climb and test his confidence in the mountains. A week before we met, Andrew had been climbing a route on the Triangle du Tacul on the Mont Blanc Massif. He and his friends had climbed the initial three-hundred meter snow slope and were perched beneath a rocky outcrop when a French mountain guide and his client came up behind them. It was a typically busy day in the French Alps with two teams higher on the route above Andrew, the French guide and his client. As the guide approached, Andrew greeted him with a “Bonjour” to which the guide replied. Immediately after this moment a microwave sized rock, kicked loose by one of the parties higher on the route passed over the rocky outcrop which protected Andrew and his friend striking the guide square in the chest, less than two meters from where they stood. The power of the strike ripped the guide and his client off the side of the mountain and they tumbled three hundred meters to the glacier below. Obviously shaken by this incident, Andrew was not keen on climbing in the mountains and would not return to do so until joining me in Peru almost two years later. Climbing in the Cordillera Blanca involves a significant amount of time on steep and exposed snow and ice. Terrain reminiscent of the site of the accident. Andrew knew I had ambitions to climb routes involving this type of terrain and it was obvious upon his arrival that he was feeling anxious. To help us address this, our plan was to start off on easier terrain and slowly increase the difficulty and hence, Andrew’s exposure to the cause of his anxiety. However this alone would not be sufficient to guarantee success. We would both have to remain conscious of how we were feeling and ask questions which challenged us to think about how we were responding to the situation. To understand why this is important, take a moment to study the cycles of anxiety and confidence as explained in the graphics below. You will notice that they contain the same four steps; cue, response, action and reward. Furthermore, you will notice that the primary difference lies in the nature of the second step; the ‘response’. In the cycle of anxiety, the response focuses on the potential negative aspects associated with the cue. For Andrew, this may be the uncomfortable feeling of falling or more likely, the injuries which he could sustain because of a fall. In the cycle of confidence on the other hand, the response focuses of positive, pragmatic actions which are likely to prevent those negative consequences from occurring. Doing so has the double effect of implementing practical steps, however more importantly it ensures your consciousness is focused on something which does not inspire fear or anxiety. Using Andrew’s situation again, such actions would include focusing on things like good climbing technique. Whenever we got the opportunity, Andrew and I would try and get some time climbing on some steeper terrain. This was his ‘cue’ which could be the cause of anxiety, or an opportunity to build his confidence. The key, as explained above would be to ensure that Andrew’s response, and his consciousness was focused on practical steps to manage the situation. I would climb to the top and set up an anchor from which Andrew could then attach himself and climb. Climbing on a ‘top-rope’ meant he could climb in safety, therefore enabling him to focus on his technique, the pragmatic response to the cue, as opposed to focusing on falling and the consequences of a fall. On his first lap, Andrew was visibly shaky at times as he tried to get a feel for the climb. Afterwards we discussed his technique and I provided tips for areas he could focus on. With each subsequent lap he took action by putting into practice what we had discussed, and the improvement was immediate. His confidence growing after each lap as a result. Andrew focusing on his technique, a pragmatic response helping him to succeed and build his confidence. After a lot of time spent climbing on a top-rope, it was time for Andrew to have a go at leading. This meant he would be above his protection and the consequences of a fall would be potentially serious. Obviously a situation where he is likely to feel more anxious. We moved to a slightly less steep section of the glacier. I encourage Andrew to concentrate on his technique, to focus on the pragmatic actions which would prevent anything negative from occurring. He set off and on his first attempt placed a lot of protection. Perhaps one piece every body length. I immediately asked him why he placed so much. Not as a point of criticism, but to get him to think about why he had responded in that way. Almost immediately Andrew said, “because I was a little sketched out”. I asked him if he had solid tool placements and felt solid on his feet to which he responded “yes”. I than asked what he thought the chances that he would fall were and he responded, “not very likely”. I went on to explain that I believed he placed as much protection as he did because he was worried more about falling than focusing on climbing with good technique, which would prevent a fall. In reality Andrew’s technique was fine; his thought process just needed to catch up. I encouraged him to try again and focus more on solid tool placements and his footwork. This time he climbed the same section placing half the amount of protection. On subsequent turns, he climbed lines to either side which were slightly steeper, again placing only a couple of pieces of pro. Each time he reached the top I asked how he felt and his typical response was, “better”. Through focusing on a pragmatic response to the cue, he was able to take positive action, enabling him to succeed and building his confidence in the process. A week later Andrew and I headed into the Santa Cruz valley to climb Alpamayo. 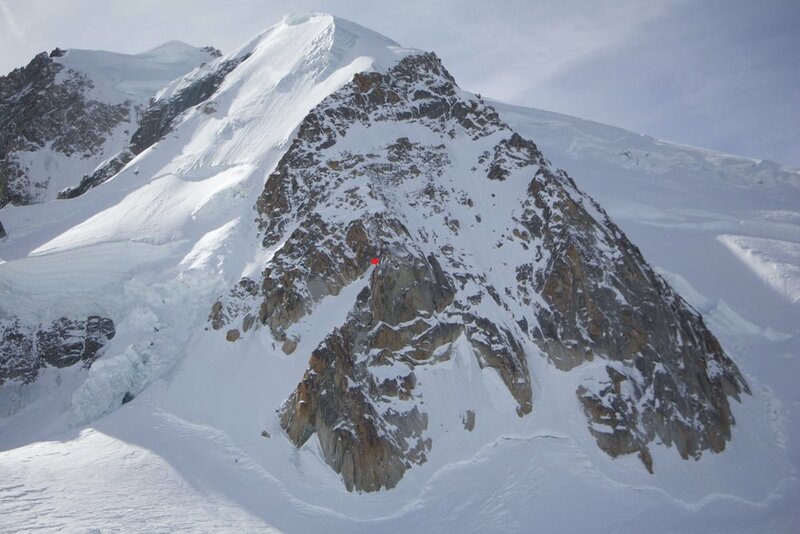 The French Direct route on the peak’s southwest face involves over four hundred meters of sustained 700 ice with large snow features threatening the route. It was the ultimate test of Andrew’s confidence. Before we commenced the route, Andrew and I had a discussion and again, I encouraged him to remain focused on climbing with good technique. What proceeded was a fantastic day out on a beautiful route. Andrew climbed well and we reached the summit six hours after starting at the bottom of the face. I was proud of our efforts and even more proud of Andrew. He had successfully turned a cycle of anxiety into a cycle of confidence. Andrew climbing the French Direct route on Alpamayo almost two years on from the accident. Andrew and I standing on the summit of Alpamayo. Whether it is climbing a steep mountain route, pitching a new initiative to your boss at work or getting out on the dance floor; understanding your response to the situation can be the difference between succumbing to anxiety or building your confidence. Take the time to understand why your respond a certain way, always try your best to identify pragmatic actions which will enable you to succeed and focus on them. It may be difficult not to think about the potential negative consequences however remember they are just that – potential consequences. They are not guaranteed and the likelihood of them occurring is greatly reduced if you can continue to focus on positive action. "It's natural to be scared, but don't let that stop you doing anything. Rationalise what you are doing, know why you are doing it and reap the rewards from pushing through." For more information about dealing with anxiety or confidence, I encourage you to visit the ReachOut Australia website.